A serious take on ''Survivor''. 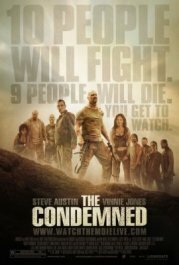 A wealthy man ''purchases'' ten people on death row, and puts them all on an island. They have to fight to the death, with the survivor getting a get-out-of-jail-free card. The whole 'reality' show is broadcast worldwide via the Internet. Reviewers were generally not impressed. Guve me back my wig!